I tried to leave a comment earlier and encountered problems with it 'hanging up' on me so I'm trying again. 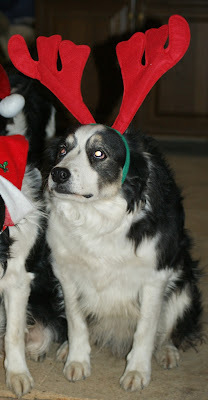 I love the Antlers but wonder how you keep them on your cute doggie. Molly would have them off and chewed to pieces in no time ... seriously! But Momma..."I wanna go fast!" You go as fast as you want sweetie! Christmas only comes once a year! That my job later today, taking a shot of Kep in a santa hat, it will be my second attempt as last time it kept falling off, now to find the gaffer tap and stapler. I believe him! Look at the face, is that a face that would lie to you? very cute! They ALWAYS promise to quit speeding.